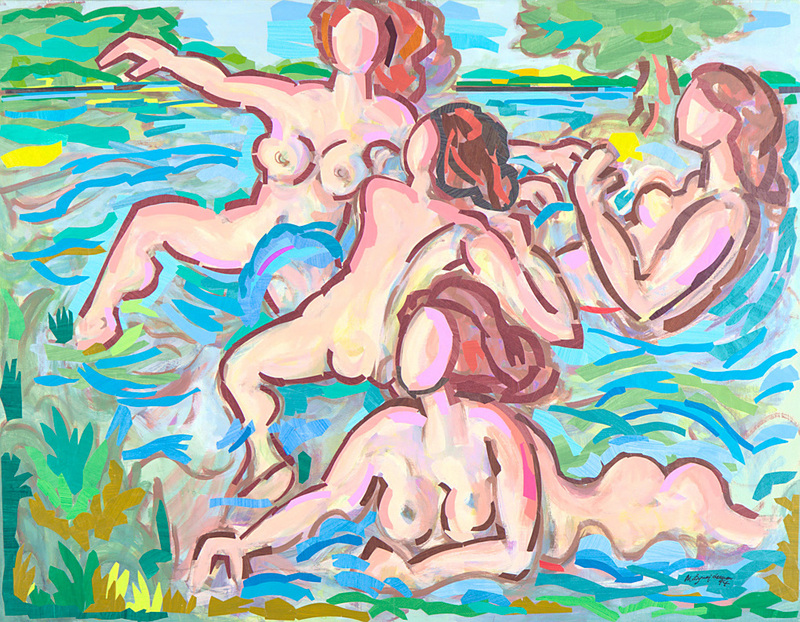 A delightful semi-abstract collage of four nudes bathing in a river by Venezuelan raised, New York artist Marius Sznajderman (1926-2018) was inspired by his fondness for the similarly named work The Bathers, by 18th century French painter Jean-Honoré Fragonard. For this original artwork, Sznajderman painted sheets of Japanese paper with acrylic paint, cut them into shapes as required by the composition and pasted them into place on a prepared wood panel. The panel is unframed and ready to hang. Signed and dated by the artist in the lower right-hand corner. Dimensions: 28" x 36" x 1.5"